So, last Friday I took Alferoo to see a lovely lady to talk about food. It was a pretty cool experience. First we got to play on the bead tables, which Alfie LOVES, and then we got him weighed and lo, the child was on the same curve as always (or in other words, he's not losing out on weight gain because we're BLW) and then we got to have a chat with Sarah, who listened, asked questions, had a discussion with me (midwives of Lister, are you taking note??!!) and concluded that yeah, we're doing pretty damn well. I nearly skipped away from that appointment. I didn't think the day could get much better, but when I got home, I had a parcel waiting for me with the coconut oil for Alfie's cupcakes. That was all the excuse I needed to cook up a batch of possibly the most anticipated cupcakes of recent times. Not since Marie Antoinette has anyone put as much faith in cake as I had in this new recipe. I was actually nervous cooking them, and not just because I'd blown a small fortune on the ingredients. Every mother wants their child to experience the pleasures that life has to give. I know cakes are a small pleasure to most, but to a little boy who can't have them, it can be a big pleasure. Luckily for all of us (by that I mean me) the cakes turned out delicious. I mean seriously yummy. 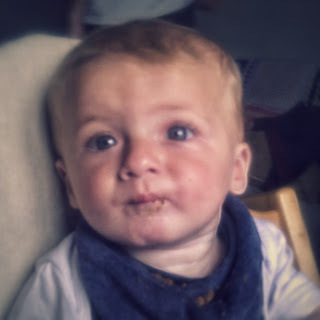 And in this particular matter, my son decided he agrees with me, cake is yum. Now we share one as pudding after dinner each night.